In this post, the sixth* in a TECHknitting series about buttonholes, we turn to correcting errors--what to do when you forget to make a button hole, but the buttonholes were supposed to be made "as you go." "...continue to decrease every 6th row at armhole edge, also remembering to work buttonholes as previously directed, and remembering also to work the six front edge stitches in garter stitch." The trouble is, you might be so busy remembering about the armhole shaping and the garter stitch for the edge that the buttonhole might escape your notice. Suppose you finish the whole front before you realize the error: replacing the missed buttonhole now means a whole lot of unraveling followed by a whole lot of re-knitting. Discouragements like this are one reason why projects get abandoned, I think. Well, take heart! There are pretty good ways to fix this problem. In this post we'll look at four variations on a trick for solving the missed-buttonhole problem without having to unravel anything. The result will look just as if you had never made a mistake in the first place. The buttonholes you did remember to make will be completely closed and completely covered up, so they'll become invisible, while the missed buttonhole is also covered up with a button, just like all the others. However, as neat as this trick is, it leads to an obvious problem, namely, how to make buttonholes--or their functional equivalents--on the other side. Variation 1: Decoration buttons with snaps beneath. In this variation, the buttons you sew on are non-functional (decoration) buttons. Best to use shank-less buttons (the kind with the holes through them, rather than the kind with a little stem or "shank" on the back). Sew these decoration buttons on flat. Next, sew snaps UNDER these buttons. Finally, sew the matching part of the snap on the OTHER front. Voilà--problem solved! On the upside, this is a very easy fix. On the downside, snaps aren't usually very pretty, and can be seen when sweater is worn open. However, you can minimize this problem by using clear plastic snaps. (The snaps at the link are jumbo snaps, better suited to knitwear than the smaller snaps more commonly available.) Or, if you're feeling crafty, you might want to consider making cloth-covered snaps, which also look very well. If you have not yet knit the opposite front, you can sew buttons on over the messed-up side, then knit the buttonholes when you do knit the other side, hopefully remembering all of this this time! Remember that in this variation, the buttons are actual, working buttons, so don't sew them on flat. Instead, use a shanked button, or a flat button sewn on with a thread shank. On the upside, this is an easy fix. On the downside, switching sides changes the convention of button-placement-by-gender (men's garments traditionally have the buttons on the right band, women's on the left). This might be an issue for some, so heads up (!) on this potential problem. This variation is used under the same circumstances as variation 2: when the opposite front has not yet been worked. Like variation 2, the buttonholes are made in the as-yet-unworked front. The difference between this variation and the one before it is that, when you sew each decoration button onto the messed-up side, you sew another button on underneath it. Stated otherwise, each decoration button has a functional "anchor button" sewn onto the back of its band, shown in red on the illustration below. It is this red hidden anchor button which does the actual buttoning through the buttonholes on the opposite band. When the sweater is buttoned, the buttonholes are completely hidden. on the other front of the garment. On the upside, this preserves the gender orientation of the button placement. It also lends a mysterious couture sort of look to the garment: the button band appears to float because the method of closure is not obvious. On the downside, it's awkward to button a hidden button into a buttonhole which lies under it. You have to put your hand inside the garment to insert or release the anchor button from the hidden buttonhole. Another downside is the bulk caused by stacking together the decoration button, the fabric of the buttonband itself and the anchor button. Using very slim buttons, such as mother-of-pearl shell buttons can minimize this problem. If variation 1 does not appeal to you because you don't like the idea of snaps, and if it's too late to use variations 2 or 3 because the other front has already been knit, a last variation remains available. In this variation, you again begin the cure by sewing buttons over the messed-up band. Then, you make loop buttonholes along the edge of the other front. 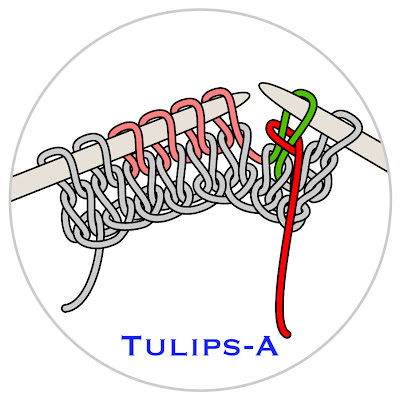 There are two ways to make such loops buttonholes (shown in red below). 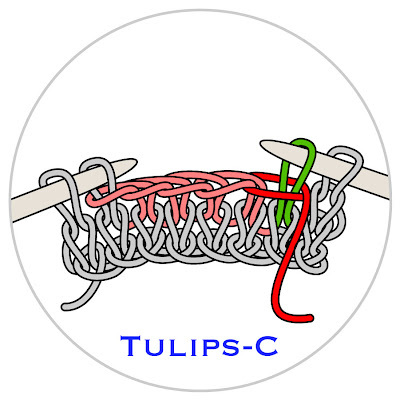 You can either slip stitch a "chain" or use an I-cord attached along the edge. The idea behind both kinds of loop buttonholes is the same: when you get to a position opposite where a button is sewn on, you detach the chain or cord to form a loose loop big enough to fit over the button--one loop per button. To see how to work a slipped stitch edge, have a look at this illustrated post (the post shows slip stitching along a garter-stitch edge, but the technique is the same regardless of whether the fabric edge is garter stitch or any other stitch). Remember to make a loose loop in order to create the buttonholes, whenever you get to the matching position opposite a button. Below is a photo of a chain buttonhole in action, looped over a pretty little glass-rose button, on a lacy cotton jacket. Below is a photo of an I-cord looped buttonhole in action, This particular I-cord was slip stitched on (same idea as the slip stitched edging, but the slip stitch was worked through both the I-cord AND the garment edge, from the front). However, if the idea of combining I cord with slip stitch makes your head want to explode, you can attach the I-cord any way you like--sewing would be one simple way. Just remember to leave the I-cord loose of the edge, wherever the loop-buttonhole should go. *Does the trick of sewing a button over a buttonhole look familiar to you? It's actually a variation on a trick for baby sweaters, where you make buttonholes on both sides of a baby sweater, then sew the buttons down over the unneeded buttonholes once you know whether the new arrival is a girl or boy (scroll to third paragraph at link). In this post--the fourth in a TECHknitting series about buttonholes*--we're going to look at vertical buttonholes. 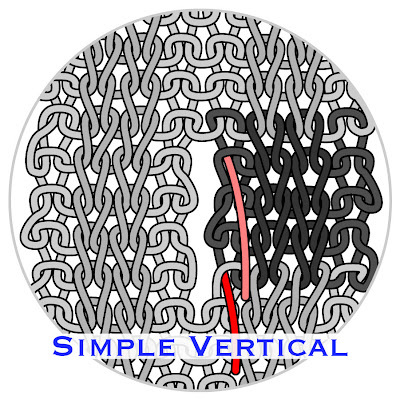 The first half of the post covers traditional (simple) vertical buttonholes, as well as the traditional sewn reinforcement: the buttonhole stitch. The second half of the post introduces two new kinds of vertical buttonholes: intarsia and sewn strip. Some of this material was previously published in Interweave Knits magazine, some of it is new. part 1: The side adjoining the garment is knitted with the running yarn, shown in lighter gray. These vertical buttonholes are somewhat fragile. 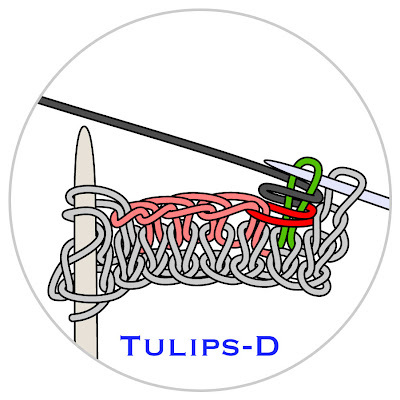 You can see that a single strand of yarn has to take the strain in various places: at the top and the bottom of the slit, and also along the side edges. In addition to being fragile, these buttonholes are also messy: two loose ends (shown in pink and in red) have to be worked in for each buttonhole made. By using two balls of yarn, it is possible to make vertical buttonholes with no sewing at all, and no pesky ends to work in at each buttonhole. The idea here is to create the buttonholes via intarsia, by actually knitting two separate strips of fabric, interlocking them via the knitting process. Intarsia is the trick of knitting two side-by-side columns of fabric at the same time, interlocking them as-you-go. Intarsia has you cast on several stitches across the bottom of fabric with one ball of yarn, then cast on the next several stitches using yarn from a different ball. As you knit across the fabric on the first row, you'll come to where the different yarn was cast on. Dropping the original yarn, you pick up the strand of the neighboring yarn from underneath and knit the rest of the row with the second yarn. Picking up from underneath in this manner twists the new yarn over the old yarn. By continuing to interlock the yarns on every row at the point where you switch from one yarn to the other, you get interlocked fabric columns made from two different balls of yarn. Although this trick is traditionally used to create neighboring vertical stripes of different colors on a garment, you can make buttonholes using this trick, too. Specifically, when you come to where you want the buttonhole, you simply work each side with its own skein of yarn for a certain distance without interlocking. When the buttonhole is as long as you want, you close the top of the slit by going back to intarsia, until you reach where you want to put the next buttonhole. On the upside, intarsia buttonholes are a pretty slick trick because they eliminate all the ends you otherwise have to work in. On the downside, not having those ends to buttonhole-stitch with means you're back to a somewhat fragile buttonhole. 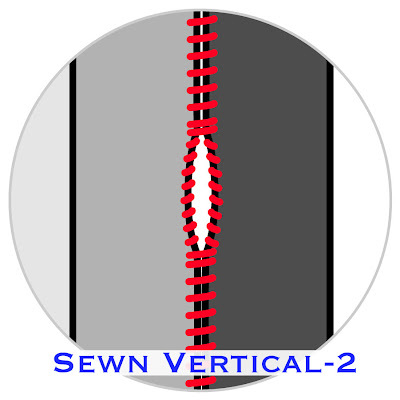 With this trick, vertical buttonholes are made by sewing on a strip of knitted fabric, leaving slits for buttonholes. The major advantage of this trick is that you can try on the finished garment, then place the buttonholes EXACTLY where they ought to go based on your custom-fit. The easiest and quickest way to proceed would be to make the inner portion of the buttonhole band as a self edge. 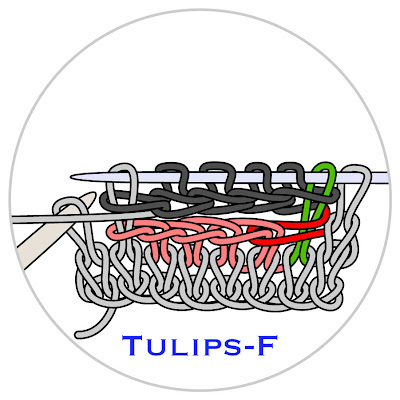 In the below diagrams, this means that the inner part of the two-part band (medium gray) is knit at the same time as the fabric of the sweater itself (light gray). The outer strip (dark gray) is then attached afterwards. 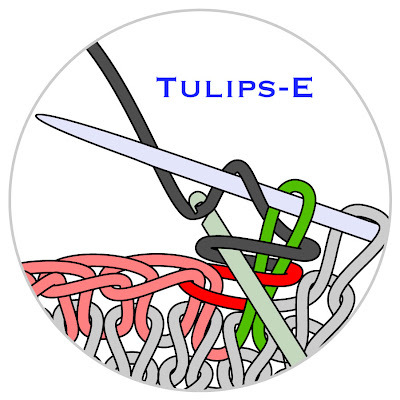 By this method, there is only one strip sewn on: the outer strip. Another variation has you knit BOTH halves of the buttonhole band after the sweater is done, then sew the inner (medium gray) to the sweater fabric (light gray) and then the outer (dark gray) to the inner (medium gray). By knitting both halves of the band afterwards, the total width of the sweater can be adjusted after the main part of the sweater has been knit and assembled. If the finished garment seems a bit snug, a surprising amount of fabric can be added with these afterthought bands. The simple overcast is not the only way to attach: a slip stitch works well with ribbing in a smooth yarn. 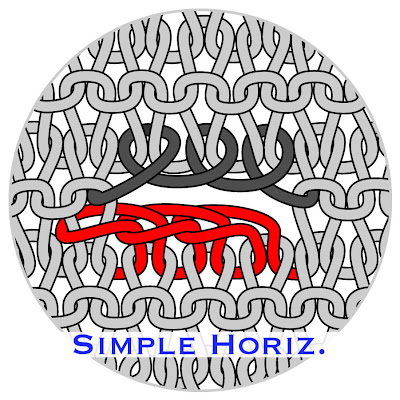 (The slip-stitch at the link is shown worked on a garter stitch background as an edging, but the identical procedure is used to attach two pieces of fabric--the hook is simply inserted through both pieces, then the same slip-stitch is performed.) Or, use any sewing or attachment method you, personally, prefer. To sum up, there are three real advantages to the sewn-strip method. 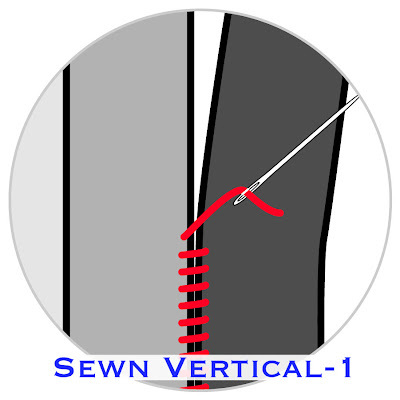 A very reinforced buttonhole is possible, because you can easily strengthen the edges and tack the slits top and bottom as you are going by with the sewing needle, as shown in the second diagram above. Flexibility in creating the total width of the band you can want to wait until you're done to knit the buttonband in two (long skinny) halves, and then attach them--the inner one to the sweater, then the outer one to the inner one. You would then knit the opposite band the same width, and attach it to the other garment front. Quite a lot of fabric can be added by this trick, yet the bands will never look like an afterthought. Flexibility in placing the buttonholes Not only can you control the total width, but, perhaps even more important, you can also choose the button spacing which best suits the finished garment. Stated otherwise, you can try on the sweater and experiment with different button placements until you like the result, then sew on the strip(s), leaving slits for buttonholes as required. For a real-life look at this trick in action, have a look at this beautiful gray lace sweater which had the buttonholes made in exactly this way. The fourth photo down is a close-up of the band. The seam from the sewing-on created the furrow down the middle of this ribbed band: it is located where the button is inserted. 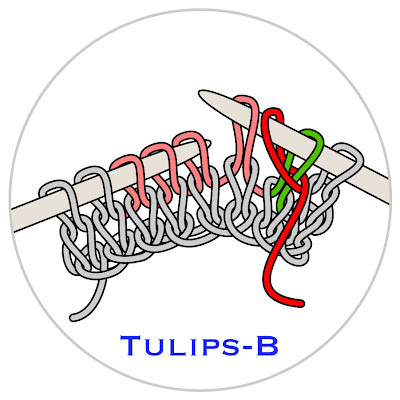 .Tulips buttonhole: the video (and an interview on Knitting Daily)You have been reading techknitting blog about vertical buttonholes, the buttonhole stitch for hand knitters, the intarsia vertical buttonhole and the sewn-strip vertical button hole.